It’s difficult to believe the mouse has been around for 40 years. (Even more difficult to believe, for me personally, is that I’ve been using one mouse or another for nearly a quarter of a century!) Forty years is an eternity in technology, and today’s input devices barely resemble those of the 1960s. As Macworld’s resident input-device geek, I’ve had the pleasure of testing many mice and mouse alternatives over the years. Here are my favorite current devices for moving a cursor around a screen (which means the iPhone’s touchscreen interface doesn’t count). They show just how far input devices have come since that first electronic rodent. This may not sound like much, but as I said back in 2006, in my countless hours of mousing about, this new scroll wheel has been the biggest mouse improvement since the scroll wheel itself—it even won an Eddy. To top it off, Logitech’s Mac driver software, which has had a well-earned reputation for being glitchy, seems to finally be stable. Check out our reviews of the MX Revolution ( ), the VX Nano, and the MX 1100 ( ). I’m a fan of well-designed trackballs; by using a large ball and smooth hardware, the best ones reduce repetitive fine-muscle movements and allow the ball’s momentum to take you across the largest of screens with a single spin. 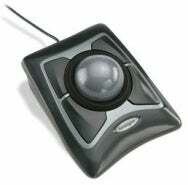 And as far back as I can remember, the trackball standard has been set by Kensington. I purchased my first TurboMouse—the original two-button version—back in the early 1990s. I later upgraded to a four-button version, and then to the TurboMouse Pro, which added USB, a mouse-style scroll wheel, and six additional buttons. Several years ago, I settled on the current generation, the Expert Mouse, which dropped the six extra buttons and the difficult-to-reach scroll wheel in favor of a large scroll ring surrounding the trackball—and in the process fixed the trackball’s biggest shortcoming. I’ve been using the Expert Mouse as my primary pointing device for nearly five years now—and I’m not alone among Macworld editors in that respect. 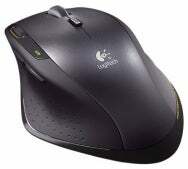 Although some users have reported problems with the latest version of Kensington’s driver software under Leopard, it’s worked flawlessly for me; my only complaint is that the Expert Mouse’s scroll ring doesn’t spin freely like the wheel on Logitech’s mice. Traditional mice are great for two-dimensional environments where you need to move a cursor across a flat plane. But if you work with 3D software, the limitations of a traditional mouse quickly become obvious. 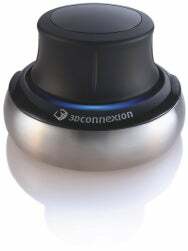 The SpaceNavigator 3D Mouse from 3Dconnexion is a deceivingly simple-looking device that makes it a breeze—and a blast—to fly through complex 3D environments (over 120 software packages are supported). The controller “knob” is mounted on a weighted, stationary metal base. You push the knob in any direction to move; tilt it to tilt your view; rotate it to turn; or push it down or lift it up to change your elevation. (There are also left and right mouse buttons.) The SpaceNavigator is surprisingly intuitive—after a few minutes of use, it feels right at home in your hand—and while it’s ideal for CAD and design software, there’s also no better way to navigate Google Earth’s virtual world. In fact, I know people who’ve blown $100 on a SpaceNavigator just to play around with Google Earth. Drawing tablets were once the purview of designers and artists, and they were priced out of range of everyday users. But just as their performance and functionality have increased, tablets’ prices have come down dramatically. My favorite consumer-level tablet is Wacom’s Bamboo Fun, which offers a small (6 by 4 inches) or medium (8 by 6 inches) drawing space, a cordless pen, and a wireless mouse for just $99 or $199, respectively. You also get pressure sensitivity that would have cost a small fortune not that long ago, several programmable buttons, and a touch-sensitive ring for scrolling and zooming. Oh, and a choice of white, blue, silver, or black. Think that just because you don’t have a budding artist in your home, you have no use for a tablet? Think again. Tablets offer ergonomic alternatives to a mouse, letting you move the cursor, click “mouse” buttons, and more using familiar writing motions. They’re also great for signing electronic documents and using handwriting-recognition software (such as Ink, built into Mac OS X, and InkBook). And since the Bamboo, like Wacom’s older Graphire model, also includes a wireless mouse—the tablet itself acts as the mouse pad—it’s easy to switch back and forth. Check out our review of the Bamboo Fun. And here's a bit of trivia: It's pronounced WAH-com, not WAY-com. It’s easy to take for granted those things we use the most often. For me, that’s the case with the trackpad on Apple’s notebooks, which over the years has improved dramatically and continues to set the industry standard (in scrolling functionality, at least, if not in the number of buttons). First, Apple added two-finger scrolling to the laptop line. Then, earlier this year, the company added true multi-touch gestures to the trackpad of the MacBook Air. And with the release of the latest MacBook and MacBook Pro models, Apple has taken multi-touch to the next level, including two-, three-, and four-finger gestures, along with doing away with a separate mouse button altogether—the entire trackpad is the button. These multi-touch trackpads take some getting used to, but once you’ve spent time with one, non-multi-touch trackpads seem downright primitive. Heck, when I’m at my desktop Mac and I want to switch between tabs in Safari, or photos in iPhoto, I find myself looking for something to swipe—the multi-touch gestures have become that ingrained in my workflow. What’s your favorite current pointing device? Let us know in the comments. Senior editor Dan Frakes covers the input-device beat for Macworld. Updated 12/9/2008, 8:59am: Corrected info on the debut of two-finger scrolling.